ItemC-09887 - "Clements Drug Store, 1896, Ashcroft, BC." ItemC-09893 - Picnic at Ashcroft. ItemC-09897 - "Lady Minto Hospital, Ashcroft." ItemC-09904 - "Cow pumching at Ashcroft Manor, BC." ItemC-09905 - "Ashcroft BC and the Thompson River." ItemC-09950 - "Tom Walker - 1879 - Johnny Lewis." ItemC-09957 - Wheat on Springfield ranch near Soda Creek. ItemC-09978 - Bill Bose, Ashcroft, BC. Item C-09904 - "Cow pumching at Ashcroft Manor, BC." 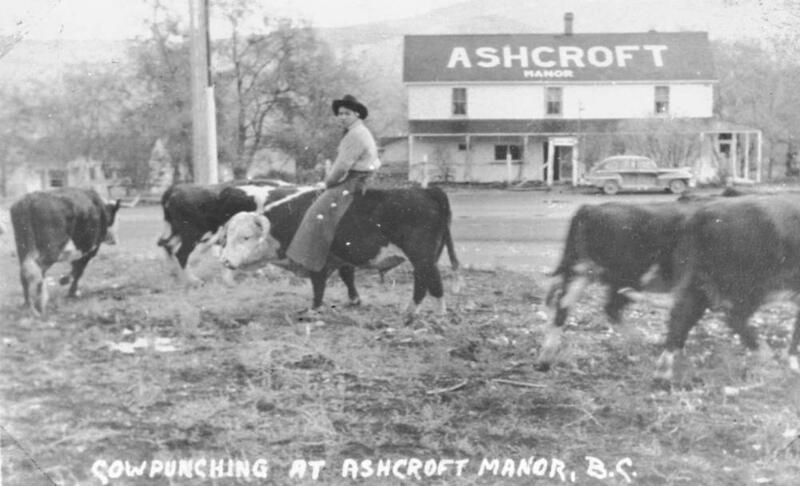 "Cow pumching at Ashcroft Manor, BC."